I bought my first bottle of the Knize Ten during a particularly long (and chilly) wet season in Los Angeles, and I remember walking to and from work for weeks — wearing Knize Ten — on streets lined with blooming jacaranda trees, their strongly perfumed blue flowers drenched with rain. Today, in Seattle, rain isn’t rare as it was in usually parched and sunny L.A., but Knize Ten still blends well with cool, stormy weather. The Viennese clothing firm Knize has been around since 1858, and it introduced its first fragrance, Knize Ten, in 1924. (Knize used images of polo players in its advertising, and “ten” is the highest handicap in polo.) There’s no doubt Knize Ten has been through some reformulations* in the last 86 years (its leather and musk notes have been softened considerably since I wore it 15 years ago), but it still possesses a crisp, “classic” vibe; it’s a debonair, spicy-floral leather fragrance. Knize Ten opens with strong, “candied” petitgrain and dusty orris (and there’s an undercurrent of “cool” carnation-clove and cinnamon notes that doesn't take the perfume into gourmand territory). In mid-development, cinnamon oil provides a smooth and interesting transition to a birch tar (leather) note. The leather phase of Knize Ten lasts longest; under the dominant leather note I smell subtle orange blossom, clove and ambergris-musk. To me, Knize Ten isn’t “sporty” so much as frisky and jaunty. It's a strange creation: a refreshing leather perfume. How many men’s fragrances of the early 20th century are still around today (and still smell good)? Not many. If you love cinnamon-clove-carnation in perfume or if you prefer your leather scents to be subtle and ‘icy’ rather than forceful and warm, give Knize Ten a try. Knize Ten was developed by perfumers François Coty and Vincent Roubert. It has very good lasting power and sillage. It's available in Eau de Toilette and matching grooming products, and it’s often found at online discounters. For buying information, see the listing for Knize under Perfume Houses. * The original ingredients list included: lemon, bergamot, orange, petitgrain, rosemary, geranium, rose, cedar, orris, carnation, cinnamon, orange blossom, sandalwood, leather, musk, moss, patchouli, ambergris, castoreum and vanilla. 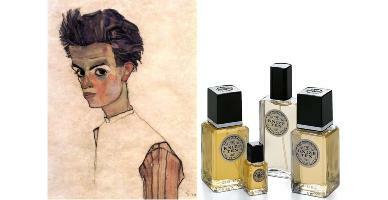 Note: top left image of Egon Schiele via Wikimedia Commons. Kevin, how would compare this, as a leather fragrance, to the birch tar leatheriness of Patchouli 24? It’s the leather note specifically I’m interested in since leather gives me trouble, but I love Patchouli 24. Sounds intriguing. It’s hard for me to even conceive of a leather scent as icy. Can you think of any other icy leathers to give me a reference point? I love leathers and an icy leather would be an interesting addition to my collection. I have always wanted to try this, it seems the US retailers are always “sold out”…..
Last nights chilly rain here in SoCal had me wearing Azuree..
Datura: loved those rainy cool nights in L.A. When I first tested K10 I hated it. With a passion. Fast fwd a couple of years – I was in Boston and stumbled upon it at that wonderful little perfume shop in Cambridge (I can’t remember the name now…) and I just loved it. So instead of buying the EdT, I purchased the K10 deodorant spray. I found that wearing the deodorant (as one would wear the fragrance) yielded a much lighter and easier-to-wear fragrance. Almost an Eau de Cologne, if you will, of K10. Nonetheless, IMO, this is not a good candidate for a blind buy. It seems to be a very polarizing scent. Mike: leather and carnation can be “problematic” for lots of people…I like Knize Ten because I’ve never met a person who wears it…it almost feels “custom made” for me. HA! Colonial Drug in Harvard Square! I’ve bought a few things there myself. They were really nice about testers and samples, too. I’ve been curious about that too…is it too manly for us girls…? And, Kevin, is it pronounced Kuh-neez? Gilty: well, the sales person in Beverly Hills where I used to buy it always said: “Kuh-KNEES-uh” Perhaps someone will comment if that’s not accurate…. Works for me! Thanks. It occurred to me it could also be Kuh-KNEECH-uh or Kuh-KNEETZ-uh..? Well, in German it would start with the hard ‘k’: “kneets-uh”. But it’s curious that they spell out “Ten” instead of “Zehn” (‘tsayn’) or using the numeral 10. The name is actually Czech, spelled with a caret over the z, meaning duke or prince. That would be pronounced k-neezh-uh. I think the Austrians (even though the German z is pronounced ts) pronounce it a bit softer, k-neesh-uh. it is a czechoslovakian name. So sorry, I have to correct myself…. I pronounced for german speaking people. Zara: sure, women can easily wear it too. Marlene Dietrich is said to have worn K10. marlene dietrich’s and billy wilders outfits were tailored by knize. I love leather notes, but this was way too harsh for me (and I like assertive leathers too!). It seared my nose hairs; I felt like I was snorting tanning chemicals. I actually threw away my sample vial, knowing I’d never want to try it again. That’s just my take on it; I’d advise women to (carefully!) try before you buy, and make sure you have some heavy-duty soap nearby in case you need to scrub. Kevin, thanks for reviewing this! Knize Ten has become one of my favorite fragrances this winter. I love its refined, cosmopolitan air; this is one leather that I’m not afraid to wear. I bought my bottle recently, and I’m wondering if it’s been reformulated again since you bought yours; my experience with it is so much different. I get a bit of the petigrain, the orris, the orange blossom, but practically no spice! In fact, I think of it as a “cozy” scent, like a big leather armchair to curl up in with a good book. Gilty, if you like leather frags, do try this one. I don’t find it too manly at all. If I had to make a comparison, I would say it’s like the base of Jolie Madame or Gomma without the violet or jasmine. Anne: I’ve smelled several new samples within the last month (one from Germany) and I can smell the clove/cinnamon easily. Hi Kevin: I need to pull out (if I can FIND!) my sample of this. I recall liking it but not being bowled over, and for some reason, I think I might have found it slightly similar to Hermès Bel Ami (which, sadly, I don’t like at all, even after re-reading your wonderful review yet again a little while ago). Something about an herbaceous leather doesn’t work for me (also cannot handle Antaeus), but I’ll definitely give K10 another go. I’ve been getting into some very animalic leathers (PG Cuir d’Iris, etc.) lately, and I’m enjoying exploring the genre. Joe: at some point, I KNOW you’ll like Bel Ami and Antaeus!! HA! I love K10, though it took me a while to get there. I got a sample of it over two years ago. I wore it a couple times. I admired it but really didn’t like it. Several months later I was traveling in Morocco and went into a leather store, the smell of which was both wonderful and immediately reminiscent of K10. When I got back home, I tried it again and discovered that I loved it. Several months later I picked up a bottle and its been in my regular (non-summer) rotation ever since. For those interested in trying this, get a nice size sample/decant. And don’t let your first impression deter you. I’m always amazed when I read reviews of this fragrance the very different ways people who like K10 describe it (you see some of these disagreements in this comment thread). If I try hard I can pick out many of the notes that people mention, but to me what stands out is the whole composition, which is so much more than the sum of its parts that, for me at least, it simply smells like K10. Phinclio: a good way to put it! I wanted to try this for a while (I’m particularly intrigued by the strawberry top note that Luca Turin mentions) so I think I’ll go ahead and order myself a sample. Some reviews make it sound quite scary but I love leathers, adore both Cuir de Russie and Bandit so perhaps I’m ready for K10 too. Abyss: oh, it’s not scary at all! Isn’t it annoying when something is perfect, except it disappears too fast? Blaiseantoine: this one has very good lasting power on me, but I do about ten sprays. Light? Sheer? Refreshing? Golly, are we smelling the same perfume? KNIZE TEN smells like a bad-boy biker dude to me, or like Lee Van Cleef in THE GOOD, THE BAD AND THE UGLY. ie., the “bad cowboy” archetype.